Rancho Bernardo is an upscale, residential community situated in a lush valley surrounded by rock-studded mountains and bordered by Lake Hodges. Located just 20 miles from Downtown San Diego, Rancho Bernardo is made up of immaculately groomed neighborhoods, numerous shopping areas, world-class golf courses, and business parks which are home to companies including Sony Electronics, Siemens and Hewlett-Packard. View more about Rancho Bernardo on Pinterest! 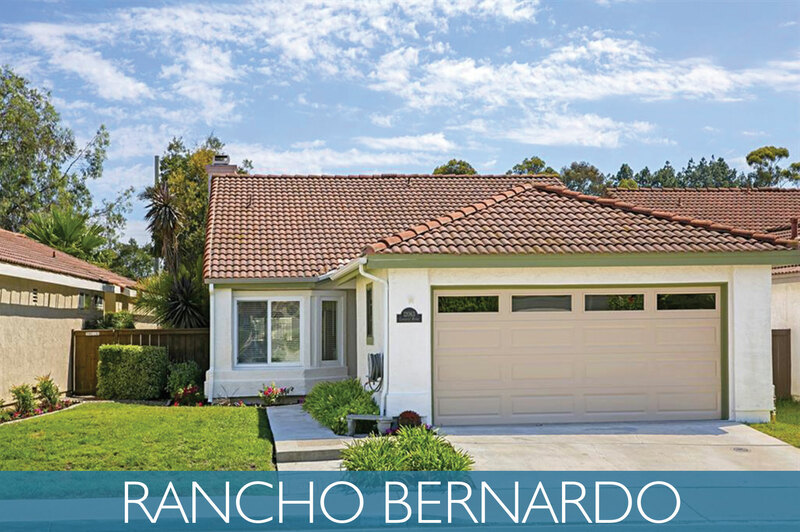 The topography of Rancho Bernardo consists of canyons and rolling hills with many homes situated along golf courses, built into the hills overseeing the valley, or overlooking Lodges Hodges for that true country feel. The community is known for being extremely well kept and appealing due to strict covenants, conditions, and restrictions. The family values in the area are very centered on education and safety. Poway Unified School District houses the majority of the Rancho Bernardo students and boasts some of the highest scores in all of California. The residents of Rancho Bernardo also have access to the spectacular Rancho Bernardo-Glassman Recreation Center and Park. Located on 40 acres of land, it consists of an indoor gymnasium, various size rooms for meetings, play areas for the young and old, eight ball fields, two outdoor basketball courts, a large outdoor gazebo, six tennis courts, lawn bowling, and a two-acre dog park. Rancho Bernardo is also host to many prestigious country clubs, resorts, and championship golf courses including Rancho Bernardo Inn Golf Resort and Spa, The County Club of Rancho Bernardo and Golf Course, and Bernardo Heights Country Club and Golf Course.